Hello! First of all, a big thank you to American Dance Abroad (ADA) for letting me introduce myself and my work to friends of ADA and other dance artists. I am KK Lam, an arts programmer from the Hong Kong Arts Festival (HKAF). The HKAF is an annual flagship performing arts festival running in February and March in the region, since its first season launched in 1973. From opera to musical, ballet to hip-hop, classic to experimental works, the stages of HKAF have hosted performances by leading local and international artists in all genres of the performing arts, including great masters like Pina Bausch and Robert Wilson, as well as up-and-coming Grammy-award stars. We also deliver a diverse range of “Festival PLUS” outreach and educational events. Photo by Cheung Wai Lok. 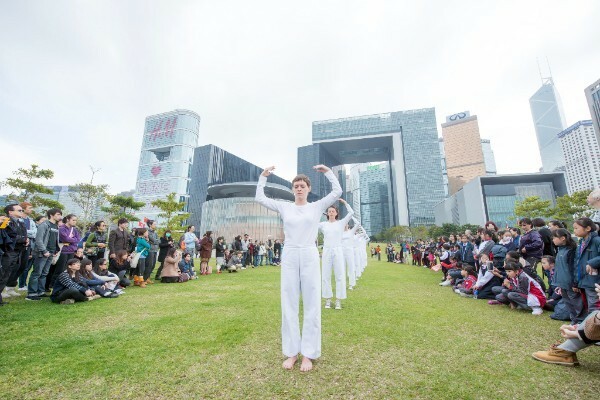 Early Works, presented by Trisha Brown Dance Company in front of the Hong Kong Government Headquarters. My joyful relationship with American contemporary dance at the HKAF began in 2014, when we introduced the first stop of the Asian farewell tour of legendary American choreographer Trisha Brown and presented eleven of her works from 1973-2011. This was a rare opportunity for local and Asian audiences to discover Brown’s distinctive style and pay tribute to her tremendous contribution in pioneering the movement of contemporary dance. Apart from her proscenium pieces, her famous Early Works were also presented in a park outside the Central Government Complex with the gorgeous Victoria Harbour as a backdrop. This remains a highlight in HKAF’s history of outdoor performances. Then, in 2015, I was invited to ADA’s American Dance Recon program, held in New York City that year. A week of intensive showcases, panel discussions and studio visits gave me an insider’s look at the current contemporary dance-scape in the States and what was trending in the market. One of the biggest harvests of the trip, apart from US $1-a-slice pizza near the DANY Studios, was definitely meeting the talented tap star Michelle Dorrance. We eventually hosted Dorrance Dance in two spirited, full-house performances in the following HKAF, plus a 6-month artist-in-residency project by herself and her artistic collaborator Nicholas Van Young, teaching 30 untrained secondary school youngsters tap dance, which culminated in a public showcase with immense energy. Michelle Dorrance’s ETM: Double Down at the 45th HKAF. Left to right: Wilson Fung, KK Lam, Michelle Dorrance, and Nicholas Van Young. Besides inviting international artists to Hong Kong, the HKAF also produces our own programs. The Hong Kong Jockey Club Contemporary Dance Series (CDS), first launched in 2012 and chiefly-curated by Associate Programme Director So Kwok-wan, is a continued effort in cultivating local contemporary dance talents. Over the past seven editions, CDS has featured 61 full, medium and short-length commissioned works with HKAF, providing professional support in arts creation, administration, marketing and technical aspects. In recent years, CDS also fosters exchange and collaboration opportunities between local and international artists through residency projects. Many of the works featured in CDS have reached beyond local audiences and received invitations to overseas dance festivals. Our team travels to different festivals to look for ideas that are original, relevant and artistically excellent. We look forward to welcoming you to HKAF in the future.” –Lam Kam-kwan, Assistant Programme Manager, Hong Kong Arts Festival. Previous ADA delegations: American Dance Recon (New York City, 2015) and SPOTLIGHT: USA (Plovdiv, 2018).